You need to have this on Thanksgiving. Trust me. Before I begin, I just want to say I am not taking credit or claiming ownership of this recipe. There are hundreds of similar ones online. I read through a few and made a some tweaks until I got what I felt would be the most enjoyable. 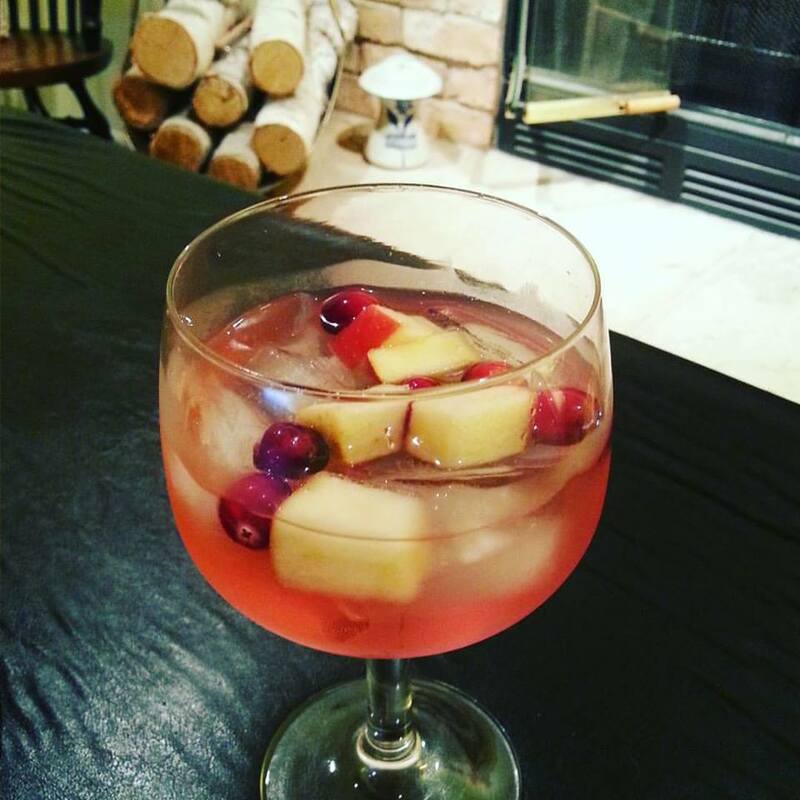 Though this is billed as a “Fall” sangria, it does have quite a summery flair if not for the cranberries which are now in season. The overall balance is perfect between sweet and tart, and the finish goes down way too easy. Here’s a couple of other tips before you make this (or any) sangria: please do not use name brand liquors. There are so many websites and shows out there that want you to use an expensive bottle of wine or the finest white rum. It really is nonsense, because when it all gets mixed together you will not know the difference. This isn’t the Food Network. This is your kitchen. Unless you have one of their salaries, do not be ashamed to make this on the cheap. For wine, I used Crane Lake ($3.99) and the rum is Seafarer, which ranges for $13-15 a 1.75 L bottle and is what I always have on hand for those summer cocktails and other kinds of sangria. Start by cubing your apples and adding them to a large pitcher along with a cup of cranberries (fresh or frozen, it does not matter) and a cup of cranberry juice. When it comes time to adding the rum and sugar, I advise mixing them in a separate bowl and heating the rum, because this will make it easier for the sugar to dissolve. If you don’t do this, chances are the granules will sink to the bottom of the pitcher. After this is done, pour in the rum/sugar mixture. You can take a wooden spoon and gently mix and muddle a little bit. Now add the whole bottle of Chardonnay and let chill in your fridge for three or four hours. Right before serving, you add the seltzer and give a quick stir. Voila, you are now ready to drink. No garnish is necessary. Though I normally have red wine sangria, this was pleasant and will do very well to compliment a big Thanksgiving meal because it is so light and smooth. Surprisingly, it is not too sweet even with all the sugar and juice, as the seltzer in the end helps to cut it. If you find that you want sweeter, you can probably substitute Sprite in place of the seltzer, but I wouldn’t recommend that. Some recipes call for white cranberry juice, but that is more expensive and won’t give you a beautiful pinkish tint. The cranberries will float through your glass and will look like such a fancy drink when it is really simple and adequately priced. Happy Thanksgiving!